Blunt chest (thoracic) trauma (TxT) and hemorrhagic shock (HS)-induced local and systemic inflammation with increased neutrophil activity often result in an impaired organ function. Next to increasing the trauma risk, binge drinking causes anti-inflammatory effects due to immunomodulatory properties of alcohol (ethanol, EtOH). The impact of clinically relevant acute binge drinking scenario on local and systemic inflammatory changes, notably regarding the activity and longevity of leukocytes, has been analyzed in a combinatory trauma model of TxT + H/R. Twenty-four female Lewis rats (190–240 g) received alcohol (5 g/kg, 30%) or saline gavage. Two hours after alcohol gavage, TxT with subsequent HS (60 min) and resuscitation (TxT + H/R) were induced. Sham-operated animals underwent surgical procedures. Bronchoalveolar lavage fluid (BAL), lung tissue, and blood were harvested 2 h after resuscitation. Pulmonary infiltration with PMN, IL-6 gene expression, systemic PMN activation, neutrophil and monocyte apoptosis (caspase-3/7), and pyroptosis/inflammasome activation (caspase-1) were evaluated. Lung damage was evaluated by hematoxylin-eosin (H/E) staining and determination of the total protein content in BAL (ANOVA, p < 0.05 was significant). TxT + H/R-induced increases in IL-6, PMN infiltration and BAL-protein concentration were significantly reduced by EtOH; however, histological morphology changes after trauma remained unaltered by EtOH. TxT + H/R-induced systemic leukocyte activation (increased CD11b and CD31, reduced CD62L expression) as well as inflammasome activation in monocytes were significantly diminished by EtOH. Apoptosis was prolonged only in PMN after TxT + H/R and was further prolonged by EtOH, an effect that was observed in sham animals as a trend as well. Acute EtOH exposure inhibits the activation of circulating leukocytes after trauma compared to controls. These EtOH-driven systemic changes may be associated with reduced infiltration with PMN after trauma as well as reduced local tissue inflammation. We thank Katrin Jurida, Kerstin Kontradowitz, and Alexander Schaible for outstanding technical assistance. BR and MP designed the study and obtained the grant. NF, NW, and SD performed the experiments. NF, BR, and NW performed the statistical analysis and wrote the manuscript. KK evaluated the histology. KM, RS, and IM made important intellectual contributions to the study and revised the manuscript. This study was supported by grants from DFG RE 3304/5-1 and DFG PE 908/3-1. Animal protocols were approved by the Veterinary Department of the Regional Council in Darmstadt, Germany. Denk, S., S. Weckbach, P. Eisele, C.K. Braun, R. Wiegner, J.J. Ohmann, L. Wrba, F.M. Hoenes, P. Kellermann, P. Radermacher, U. Wachter, S. Hafner, O. McCook, A. Schultze, A. Palmer, S. Braumuller, F. Gebhard, and M. Huber-Lang. 2018. Role of hemorrhagic shock in experimental polytrauma. Shock 49(2):154-163. https://doi.org/10.1097/SHK.0000000000000925. Awad, F., E. Assrawi, C. Louvrier, C. Jumeau, S. Georgin-Lavialle, G. Grateau, S. Amselem, I. Giurgea, and S.A. Karabina. 2018. 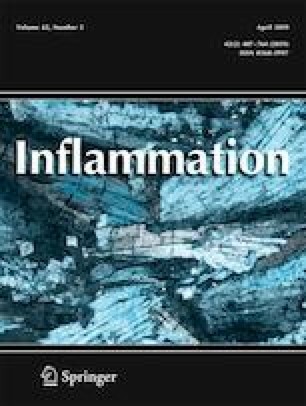 Inflammasome biology, molecular pathology and therapeutic implications. Pharmacology & Therapeutics 187:133-149. https://doi.org/10.1016/j.pharmthera.2018.02.011.